When you're a kid, all you want to do is skate. Jobs, rent, relationships, student loans, "your future," whether or not the door person at the bar you're going to after skating will let you in with your board—none of these things matter. As you get older there are more things to worry about and less time to take care of them all. Everyone reaches a point when they can no longer skate for 10 hours straight. Being a kid pushing around the city with little concern for time, you learn to make your money stretch. When your pockets only contain some loose change, a Metrocard, and nuggets of wax, the quarter snack from the bodega is the most viable option. Once you can afford actual meals and overpriced New York rent, the quarter snack becomes a symbol of a simpler time, back when you were content with skating on a diet that could lead to diabetes if not phased out by 19. That's when things were a lot more fun. Quartersnacks, an online epicenter for the skate culture of Downtown New York, never cared about "best-of-the-best skateboarding." Instead, with acute self-awareness and biting humor, it chronicles the exploits of everyone bound together by a common interest in skateboarding in New York. Life isn't a high school movie where a crew of the best skaters in town exclusively skates together and terrorizes the losers. In New York everyone skates with everyone else—"talent" is secondary. Quartersnacks captures the energy of a session in the city with your childhood friends, some younger kids you just met just last year when they moved here for college, their friends visiting from out of town, and some token pros, all skating together. In the ten years that Quartersnacks has been active, New York has become a national hub for skateboarding (at least in the warm months) and more kids are skating worldwide than ever. TF at 1: Ten Years of Quartersnacks collects the best and worst from the site, along with new essays, and documentation of the spots, the shops, the slang, and everything else that has changed and remained the same in New York skating in the past decade. Quartersnacks was founded in 2005 by a generation of New York skaters who grew up with the internet—sharing spots on message boards, and meeting people online to go skate with in other parts of the city. Since then, it has become the anti-authoritarian authority on East Coast skating. In 2014 Nike SB released a limited Quartersnacks edition dunk. 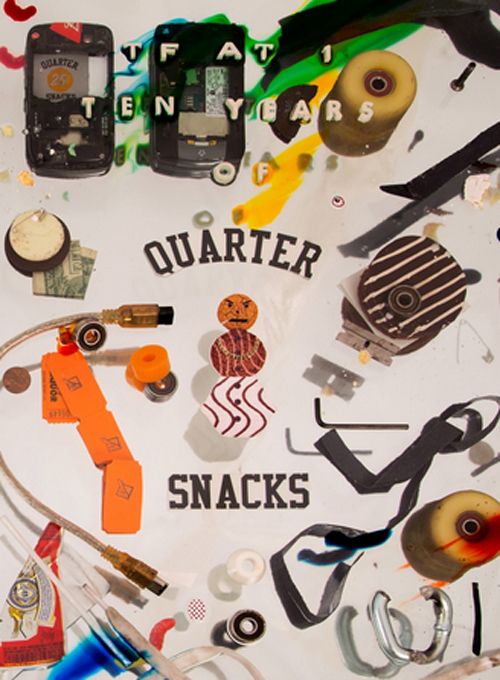 In fall 2015 Quartersnacks will celebrate it's 10th anniversary.